D.C. Mayor Muriel Bowser, a Democrat, hasn’t responded to multiple requests for comment about the mob that issued threats and damaged property outside Fox News host Tucker Carlson’s house on Nov. 7. D.C. police are actively investigating the mob’s actions as a “suspected hate crime” with “anti-political” motivations. Bowser came under fire in April for failing to fire a political appointee who partook in a rally where a Nation of Islam representative hurled anti-Semitic insults at a D.C. Council member. 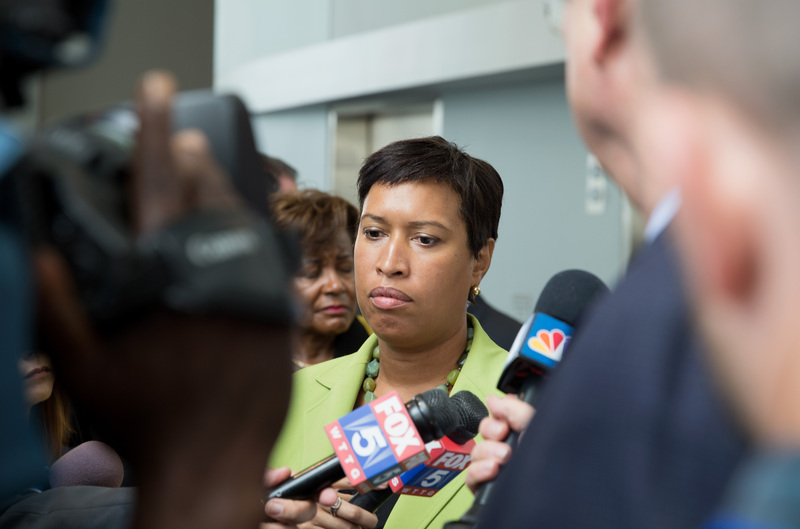 District of Columbia Mayor Muriel Bowser is remaining tight-lipped about the left-wing mob that issued threats and damaged property outside Fox News host Tucker Carlson’s house on Nov. 7. Bowser has failed to respond to multiple requests for comment by The Daily Caller News Foundation about the incident, which D.C. police are currently investigating as a “suspected hate crime” with “anti-political” motivations. The mayor released a statement following the rally that her political appointee needed “to apologize and make it abundantly clear that he denounces all hateful comments,” but she didn’t call for his resignation. Lopez resigned from his post a few days after the rally. Carlson said his wife, who was home alone at the time, thought she was the victim of a home invasion. An anarchy symbol was spray painted on Carlson’s driveway and signs referencing his political affiliation were left on vehicles parked in the driveway and on his front door, according to a police report obtained by TheDCNF. Approximately 20 people were outside Carlson’s house when police arrived on the scene, according to the report. It’s unclear why none of the participants of the mob were arrested at the scene. OFFICIAL TUCKER CARLSON MOB POLICE REPORT ???? “There is no further information available as this case remains under investigation,” Metropolitan Police Department spokeswoman Alaina Gertz told TheDCNF when asked for an update on the investigation. It also remains unclear who partook in the doxxing and mobbing of Carlson’s house, but it appears that Smash Racism DC began planning the action more than a month ago. Carlson’s home address, along with the addresses of TheDCNF co-founder Neil Patel, Fox News host Sean Hannity and other conservative media personalities, was first made public on a public-facing Pastebin document posted in late September. “Do not post this on social media, plan,” stated the Pastebin document, which has now been deleted. Smash Racism DC co-founder Mike Isaacson, who appeared on Carlson’s Fox News show in 2017, also wrote on his blog on Nov. 8 that an active member of the group notified him that the personal information of Carlson and other “far right personalities” had been obtained. I haven’t worked with Smash Racism DC in three years but support their actions. Thanks for playing. Smash Racism DC’s Twitter account was banned on Nov. 7 for posting tweets containing Carlson’s home address. The group attempted to open up a new Twitter account, which was suspended Wednesday after The Daily Caller reported its existence.